Smart chefs know the importance of keeping quality cutlery on hand. 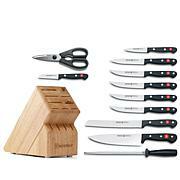 Renowned knife maker Wüsthof has been delivering just that for years and this set is no exception. 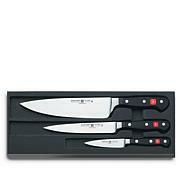 Their laser-cut blades, balanced design and specialized blade styles can tackle most any cutting job your kitchen presents. They even included a sharpening steel and a pair of handy kitchen shears ... and, of course, a handsome wood block to securely stow it all. I am very pleased with this knife set. this is the best I ever used before. thank you. So far so good! 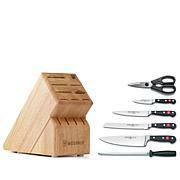 The knife set is beautiful and they seem very sharp! Now I just need to learn what to do with each of them! I love the knives. 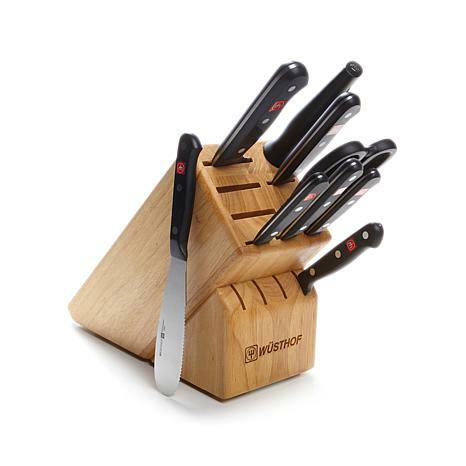 My only complaint is that I have no idea what knife goes where in block and also have no idea what knife the remaining spaces are intended for. Quality speaking, these are what I expected and will never buy cheap quality knives again after using these.